Floral theme is the perfect way to denote soft and tender nature of an organization in any circumstances. To give a creative shape, designers should nudge their ideas to obtain a refined and unique output. Here, you can find beautiful and ideal gathering of Rose Logo Designs that comes in high quality with great resolution and are available for free downloads. Here is a beautiful rose logo design that is best suited for showcasing your coffee shop or coffee related concepts. It comes in a beautiful pink color and very creative. This is another wonderful rose logo template, designed especially for the soap. It comes with a clean display and a beautiful pink rose at the center. Download it right away! Get this beautiful rose logo design if you are looking for an attractive and bigger display of the rose. It shows a pink rose at the center, enlarged to perfection. Here is another beautiful rose logo art, viewed and liked by a lot of users. You can use it for showcasing any concept that is soft, pleasant, like the rose. Get this creative and beautiful dual rose logo design, in a wonderful display format and color. Use it for printing on cards, company logos, restaurant themes, promotions, pamphlets, crockery, etc. This rose logo is made for food services. It is perfect to be used to showcase your food and catering service that is as good and wonderful as the rose. Get this rose logo design that is simple yet creative and best suitable for promoting any kind of services. You can use it on company logos, flyers, promotions, pamphlets, etc. 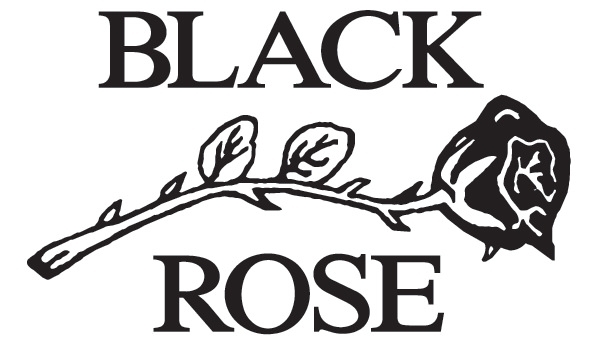 Here is a black rose logo design with only black color on the display. It can be used for leather textures or other concepts that you find it suitable for. Here is a stunning and beautiful rose logo that comes in an attractive lavender color, with golden colored rose. It is perfect for printing on glass, fabric, cards, crockery, etc. Get this wild rose florist logo design, with purple and green color and a clean display. It can be printed and customized according to your needs so download right away! Here is a classy, lovely rose logo with a black background and rose in light pink color. You are sure to love this design and use it for any purpose. Get this beautiful rose logo design, named as green rose. You will love this design if you are looking for a simplistic and small rose for the promotion of services. It sounds so easy to customize and redesign these Logos, with minimal clicks. This iconic collection of Inspiration can be printed on any fabric material, crockery, party flyers, restaurant tissue papers, brochures or pamphlets and wraps of domestic grocery items, for business and service promotions.